Here is a map contains territory of Belarus. interesting map of Kobryn calibrated presented. 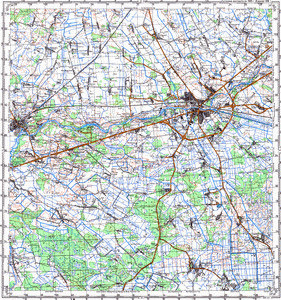 free map of Zhabinka 1 cm to 1 km presented. actual map of Zalyessye и OziExplorer calibration for you. free map of Yezhiki free download. detailed map of Yeremichi и OziExplorer calibration displayed. topographic map of Vyerkhalyessye calibrated here. free map of Verkhi calibrated free download. actual map of Velikiye Ogorodniki и OziExplorer calibration free download. interesting map of Velikiye Korchitsy for gps. topographic map of Telyaki here. map of Sychevo и OziExplorer calibration download for free. map of Svozy with gps calibration free download. map of Strii this. actual map of Stryhava for you. topographic map of Striganets и OziExplorer calibration displayed. interesting map of Stawpy free download. detailed map of Staroye Syalo for gps.